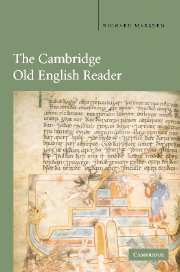 The fifty-six prose and verse texts in this major new reader of Old English, the language spoken by the Anglo-Saxons before the Norman Conquest, include established favorites such as The Battle of Maldon and King Alfred's Preface to his Pastoral Care. It also includes some less familiar works. Modern English word glosses and explanatory notes are on the same page of the text. Other features include a reference grammar and a comprehensive glossary. The Reader is designed for undergraduate and advanced students. Introduction: the writing and pronunciation of Old English; The texts: 1. Teaching and learning (ten texts); 2. Keeping a record (nine texts); 3. Spreading the word (nine texts); 4. Example and exhortation (nine texts); 5. Telling tales (seven texts); 6. Reflection and lament (12 texts); Manuscripts and emendations; Reference grammar; Glossary; Guide to terms; Index of people, places and topics.